LAEDC’s Institute for Applied Economics has published the new 2016 People, Industry, and Jobs, an annual study on LA County’s workforce needs, occupational forecasts, and skills required by occupations, to provide workforce development intelligence as part of our ongoing partnership with our regional Workforce Development Boards (WDBs) and other education and workforce development partners. Both the City of Los Angeles and Los Angeles County regions are detailed, and LAEDC would like to thank both County of L.A. and City of L.A. for their support. from 2015, please click HERE. 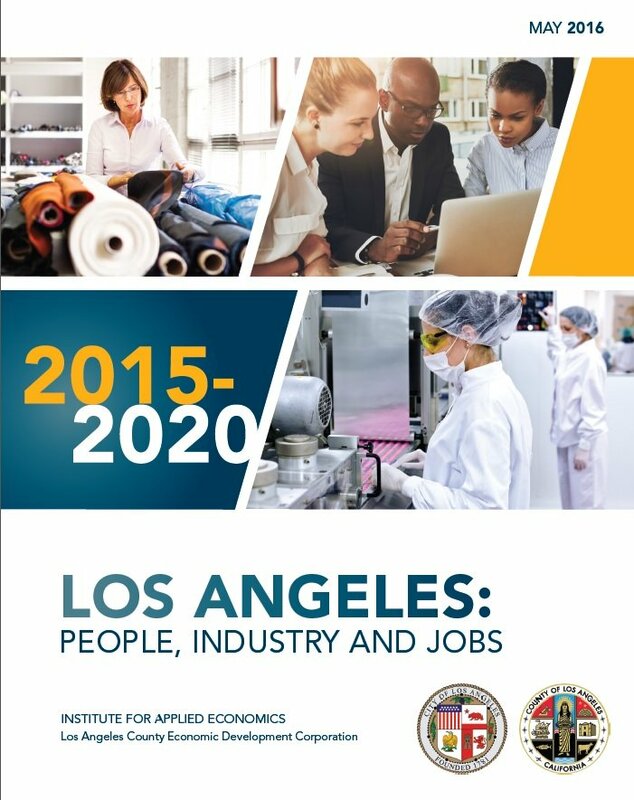 LOS ANGELES, CA – (June 1, 2016) Today, the Los Angeles County Economic Development Corporation (LAEDC) published the second edition of the annual report, People, Industries and Jobs. The report provides occupational forecasts and industry growth forecasts for the region. The research was conducted to inform workforce development efforts and identifies the skills requirements of projected job openings in the coming years. The report offers findings for both the City of Los Angeles and County of Los Angeles, and was sponsored by the Workforce Development Boards (WDBs) of both the County and City of Los Angeles. The report supports implementation of the Workforce Innovation and Opportunity Act of 2014 (WIOA) which requires WDBs to engage in a holistic and regionally cooperative approach to programs, so that workforce development is better aligned with economic development priorities, and indeed aligned with the specific occupations where job opportunity is likely to increase. Employment growth of 1.5 percent annually over the next five years is expected to add 346,100 jobs in Los Angeles County and 122,700 jobs in LA City, across a broad range of industry sectors. The most competitive industries in L.A., in terms of regional concentration, include motion picture and sound recording, apparel manufacturing, performing arts and spectator sports, air transportation, and broadcasting. Industry sectors with the highest projected growth rates (in percentage) are construction, professional and business services, education and health care services, and leisure and hospitality. Industries forecast to create the most overall jobs are administrative and support services, food services, social assistance and professional and technical services. Middle-skilled occupations (those requiring more than a high school credential but less than a bachelor’s degree) with the greatest hiring potential are registered nurses, teaching assistants, heavy and tractor-trailer truck drivers, nursing and medical assistants, and licensed practical/licensed vocational nurses (LPN/LVN). Largest total job growth (new and replacement) is forecast in office and administrative occupations and food preparation and serving occupations, with 115,770 and 114,680 jobs respectively (in LA County). Those are also the largest occupational groups in the region now. Occupations that provide the greatest overall quantity of job openings in the next five years generally require lower levels of education and training. Industry Cluster growth strategies and workforce development strategies for the Los Angeles region are outlined in the 2016-2020 L.A. County Strategic Plan for Economic Development, which identifies key industries and lists steps our region can take collaboratively to foster growth of these industries and jobs, and ensure more of our residents can access those opportunities.